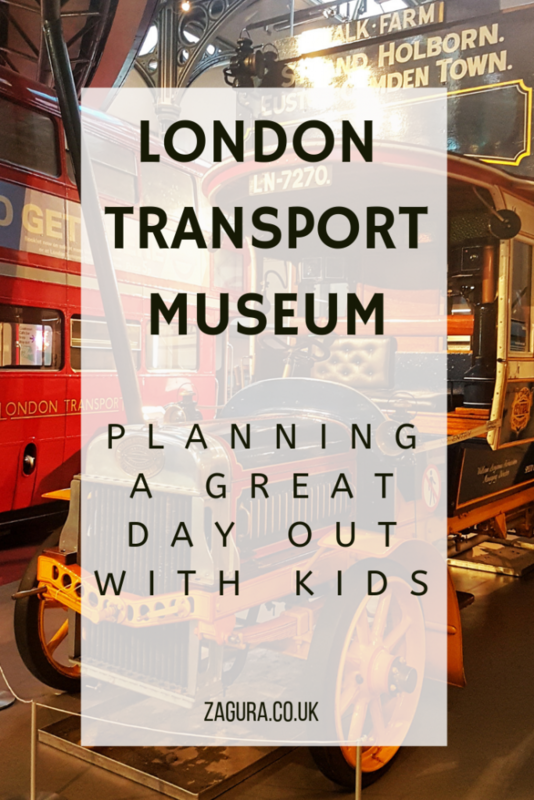 One of the first museums we have ever been to with the kids was London Transport Museum. The first time we went with my son when he was one year old and a few months. 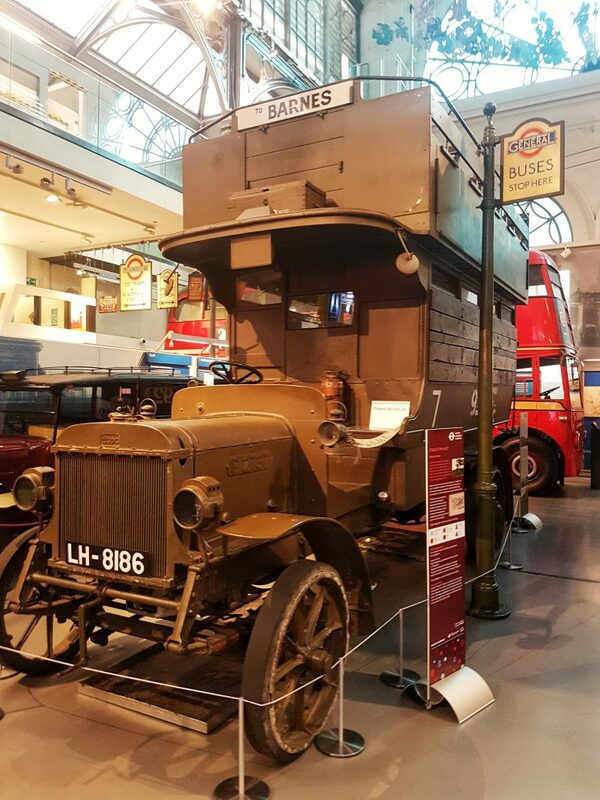 Since then, we’ve been visiting the museum on a regular basis. 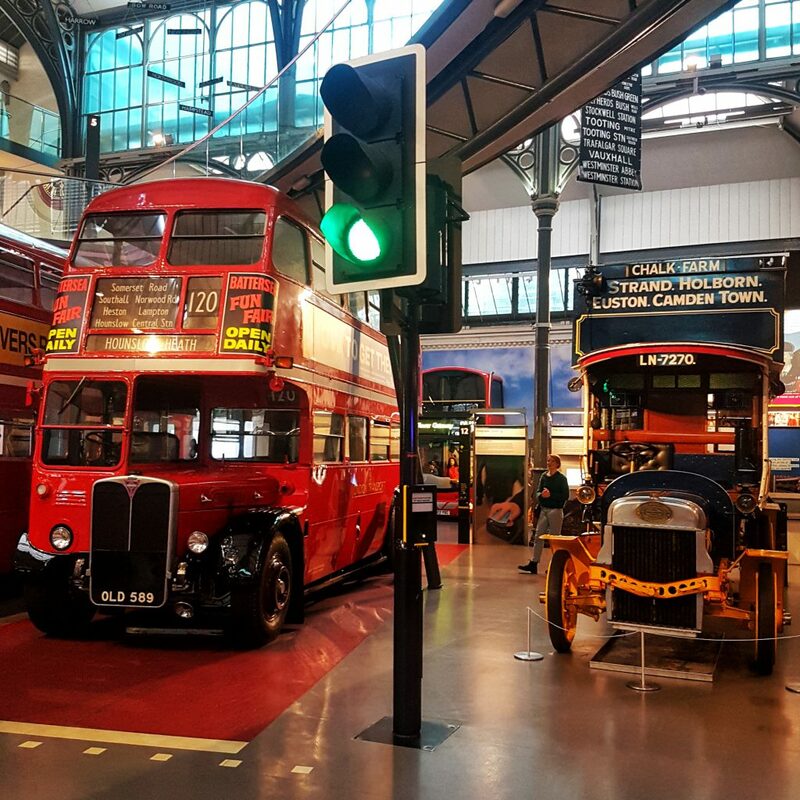 London Transport Museum is one of my kids’ favourite destinations in central London. 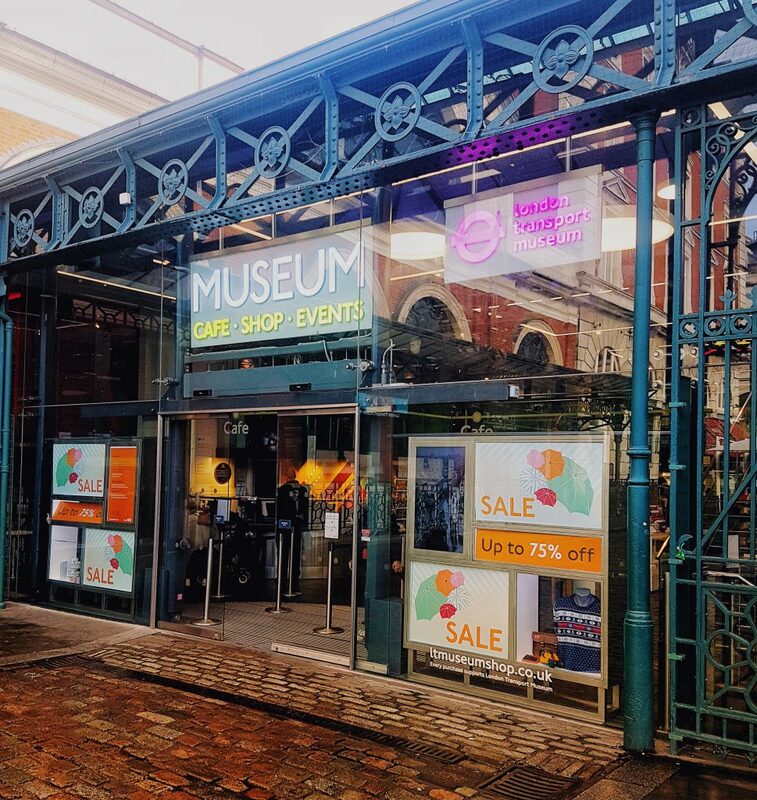 The museum is located in Covent Garden and is housed in the old Grade II-listed Flower Market building. The entrance is next to the Jubilee Market. 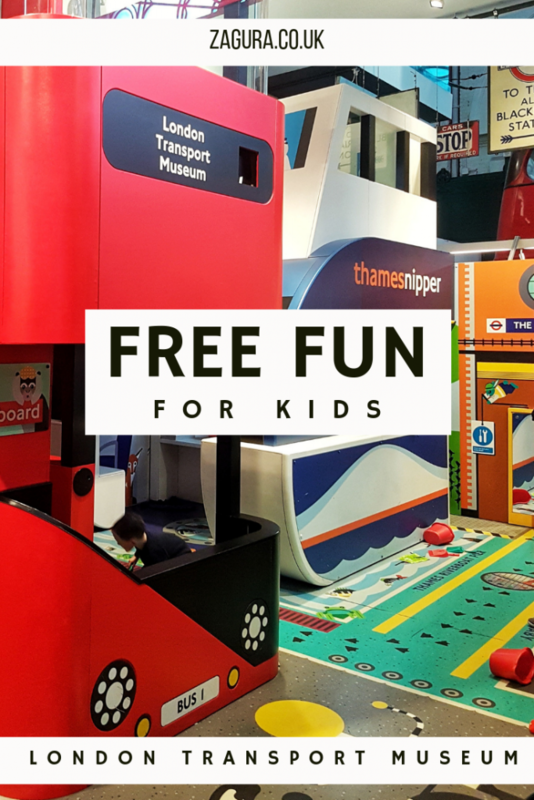 Once you are in, remember to take the Stamp Trail for the kids from the office or cloakroom. 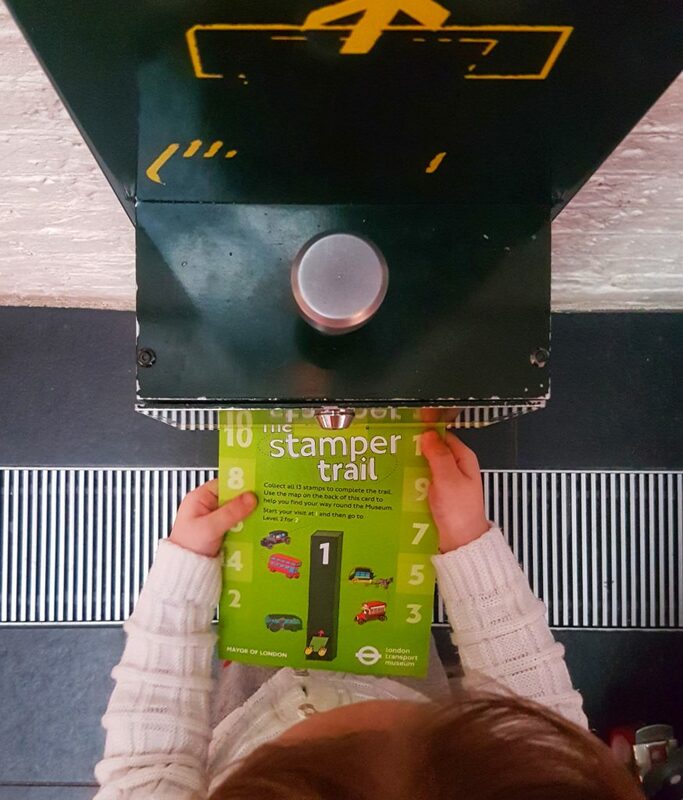 With it, kids have to find 13 stamps all around the museum, which is incredibly fun for them: after years of visiting the museum, we still get a stamp trail every time and enjoy the trail! With the Stamper trail in your hands, go and find the first stamp and afterwards follow the signs to the elevator, which will take you back in time to year 1800. 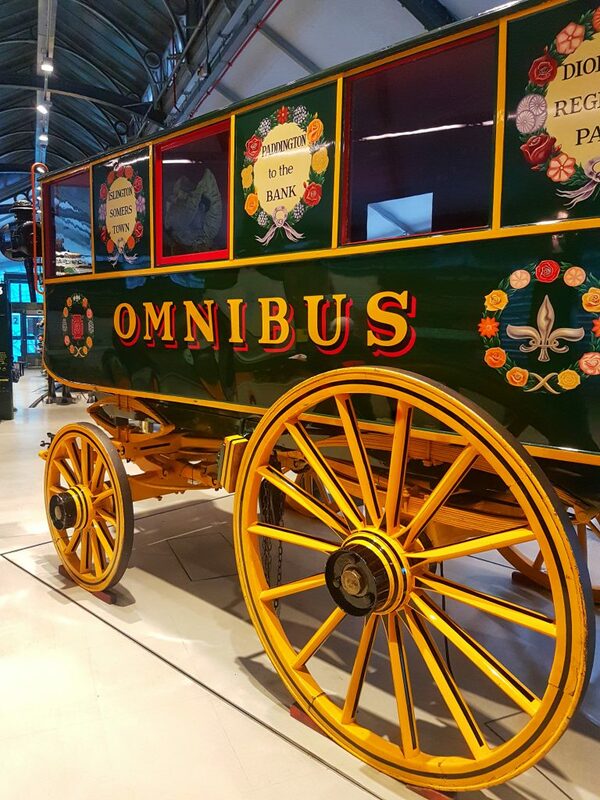 Here is where you can climb up the Shillibeer Omnibus and get a feeling of how people used to travel from Paddington to Bank in 1829 when George Shillibeer started the first omnibus service using three horses. 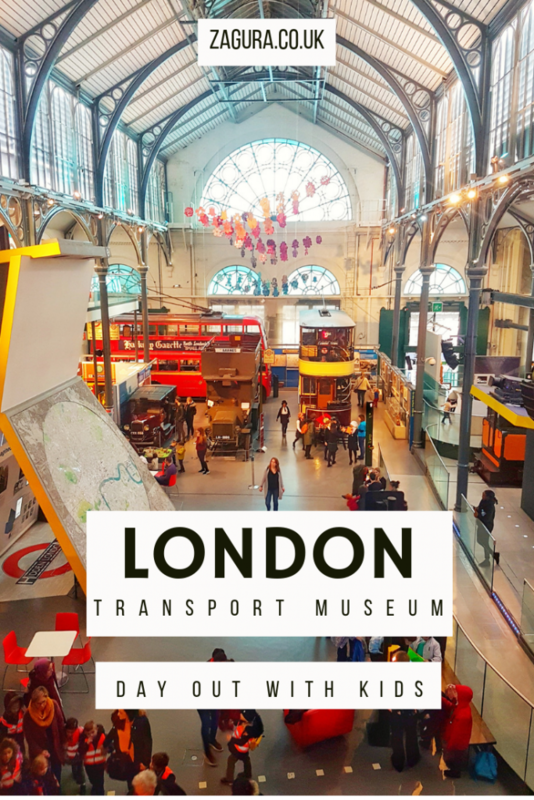 This is also the place to find out more about how London used to be when horses were the pulling force when it came to travelling. 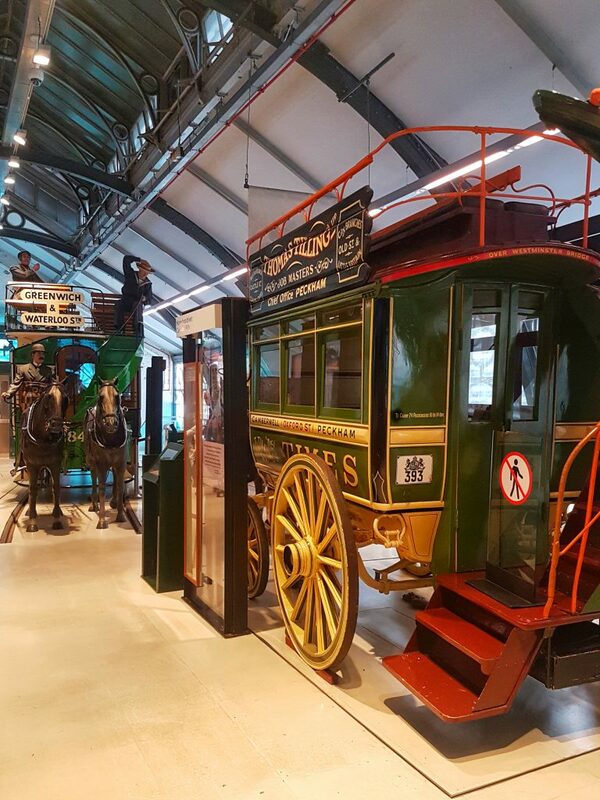 You can also admire some real-life sized horses and a double deck horse tram (No 284), built by John Stephenson & Co New York in 1882. 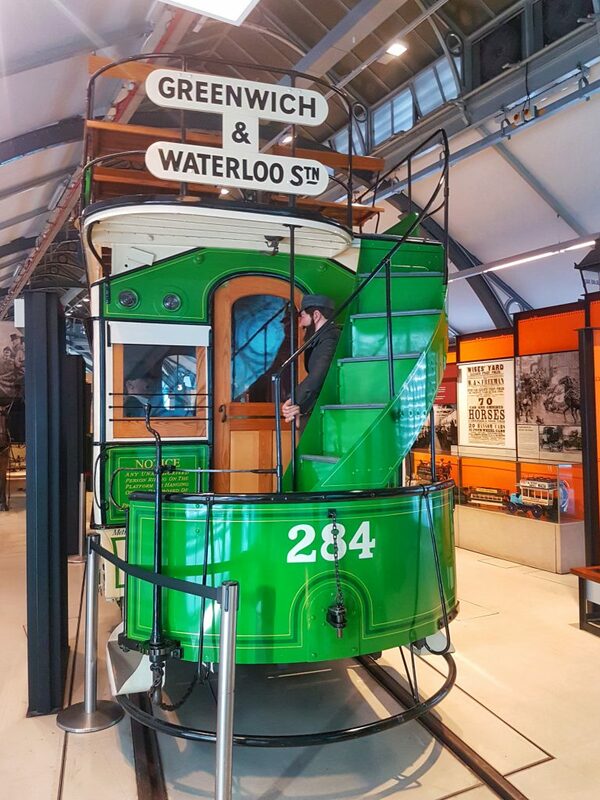 This tram operated from Waterloo to Greenwich for 28 year, until it was replaced by an electric tram service in 1910. 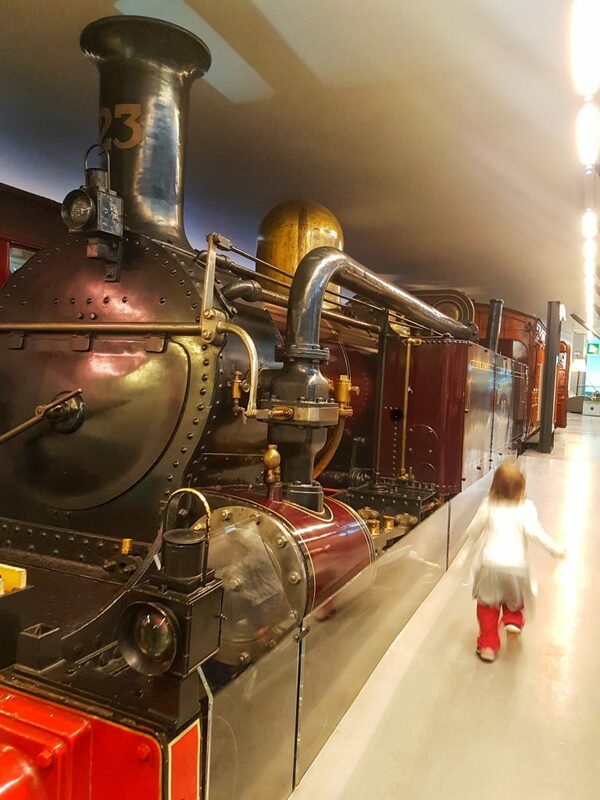 The first floor can be reached by lift or stairs and part of it is dedicated to the Steam Underground, taking you back in time to 1863-1905. 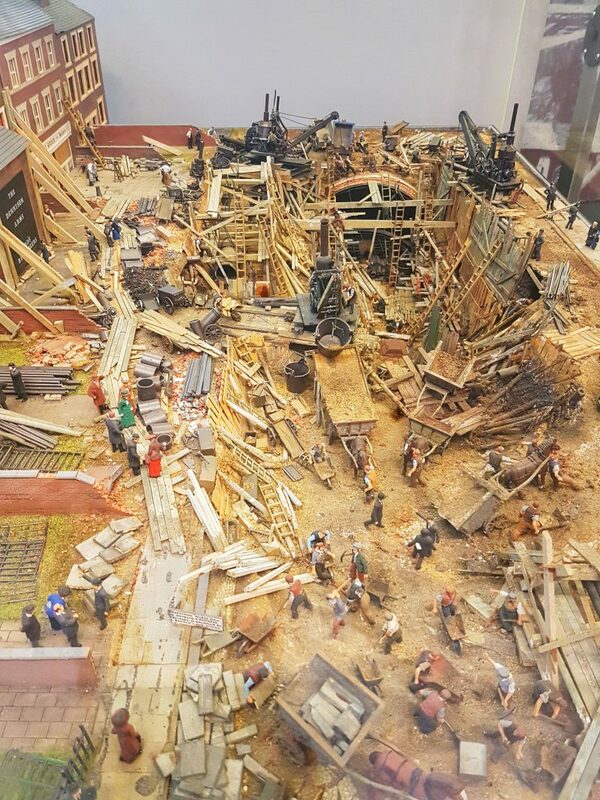 Here you can read the story of the first underground railway, which was build by hand by more the 2000 navvies. 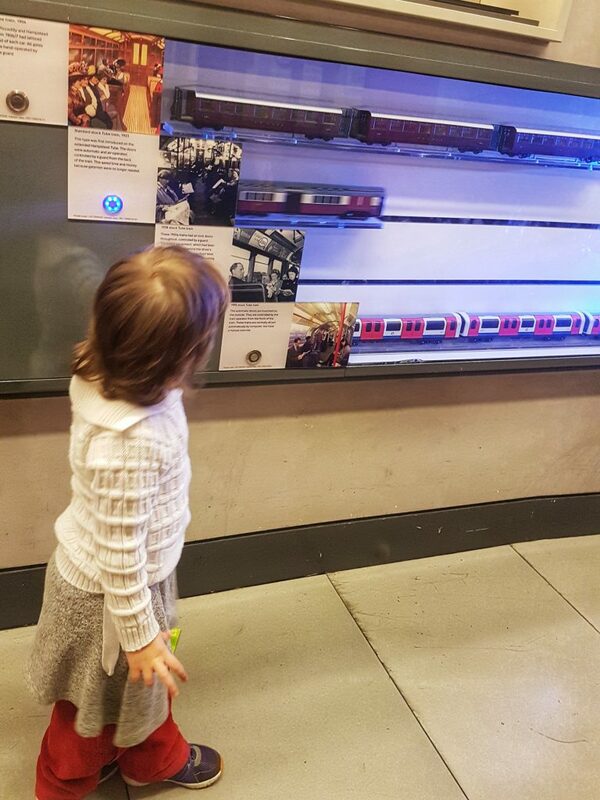 And in case your kids love the old steam locomotives and trains, they will love the red painted steam locomotive built by Beyer Peacock in Manchester in 1866. 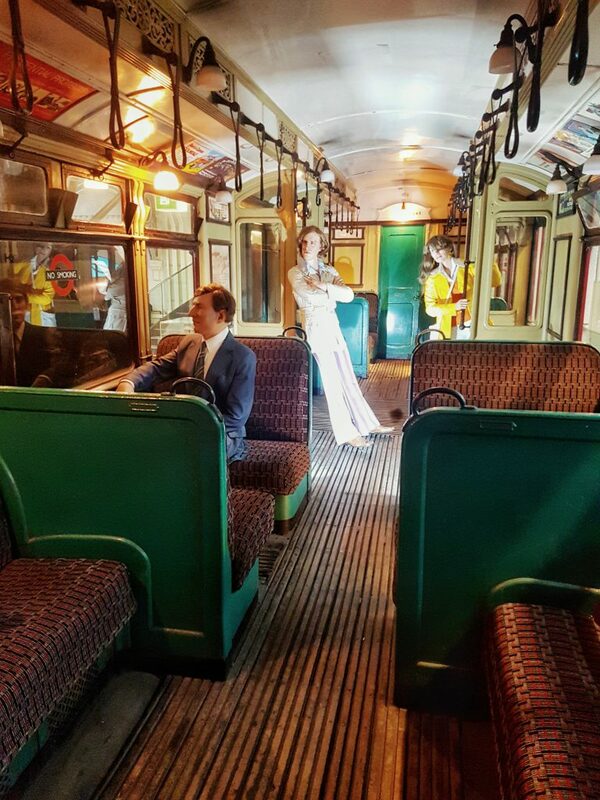 You can also get on board and get a feeling of how it was to travel on the Circle line over a hundred years ago! The atmospheric pollution was terrible so this locomotive came out of service in 1905 when the Circle line was electrified. 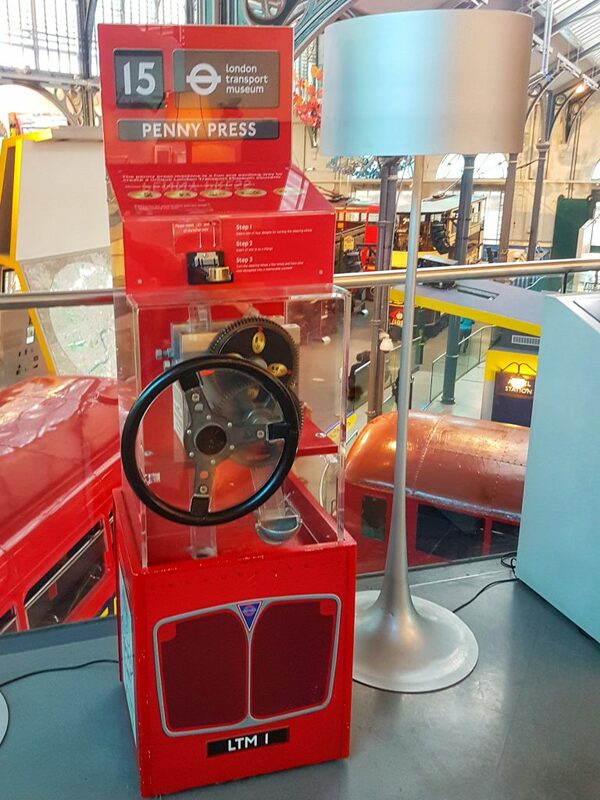 Or maybe you want to imagine travelling with a 1922 Metropolitan Railway electric locomotive, in which case you are in luck: the railway vehicle on this floor ran in passenger service until 9 September 1961. 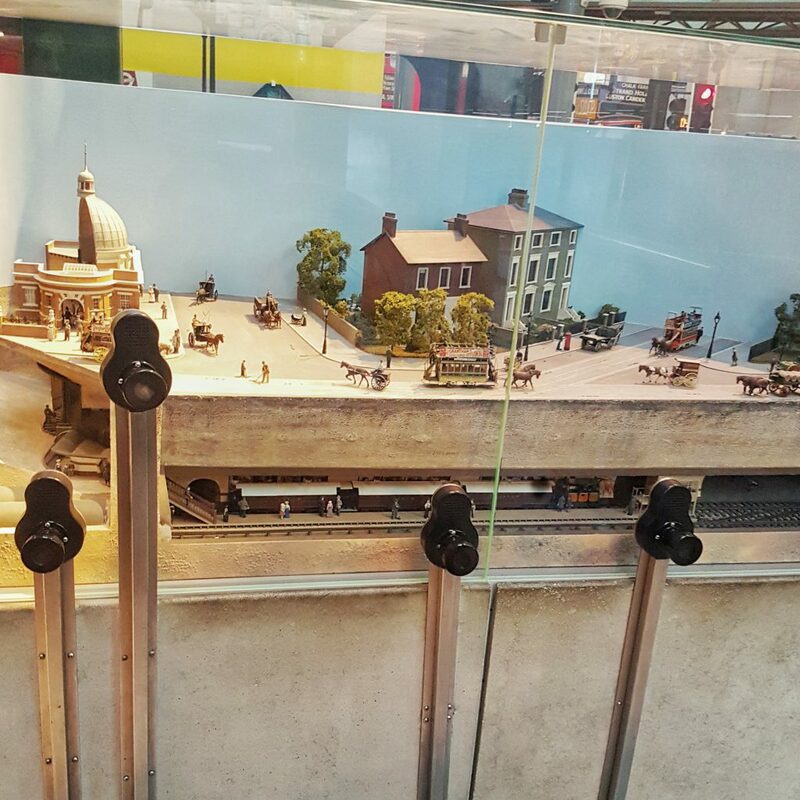 This type locomotives had 1,200 horsepower and were the most powerful to work on the Underground. 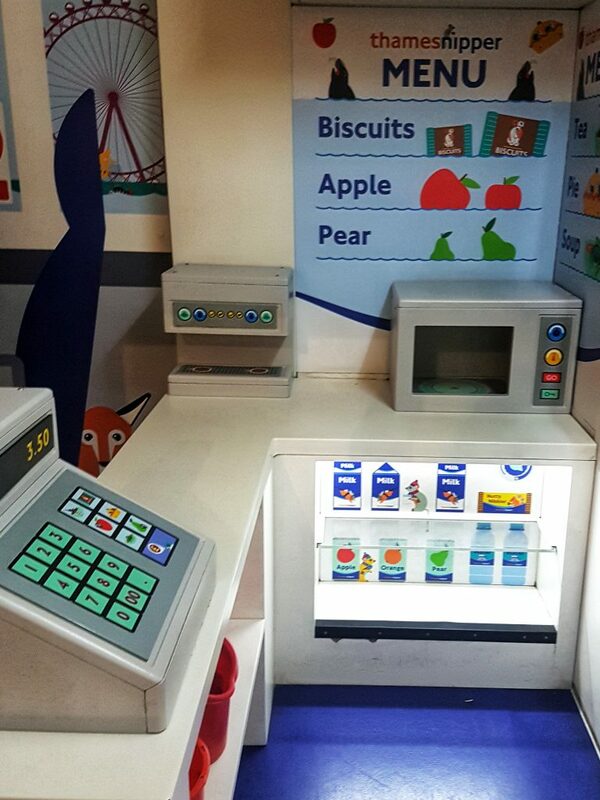 Jump on board, you might ‘meet’ other passengers too! 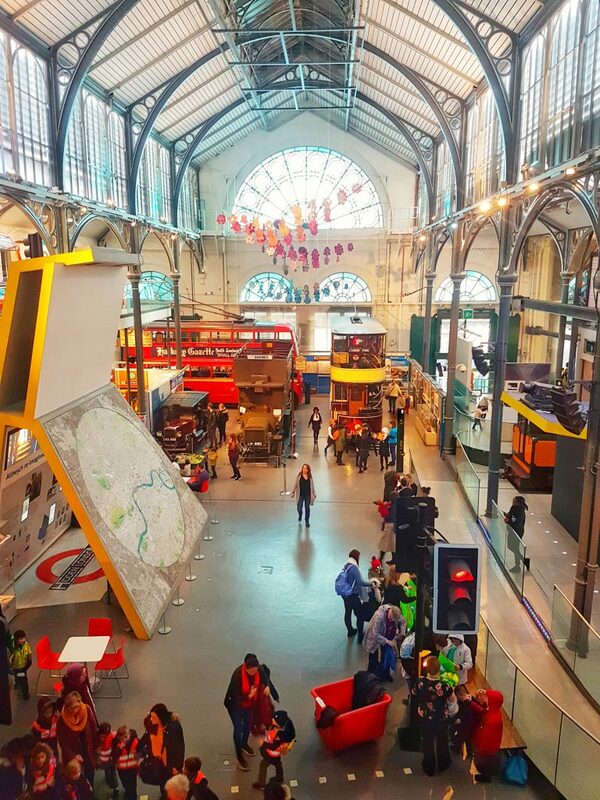 On this floor, you will find a great play area for kids of all ages, from where you can also admire the museum from above. 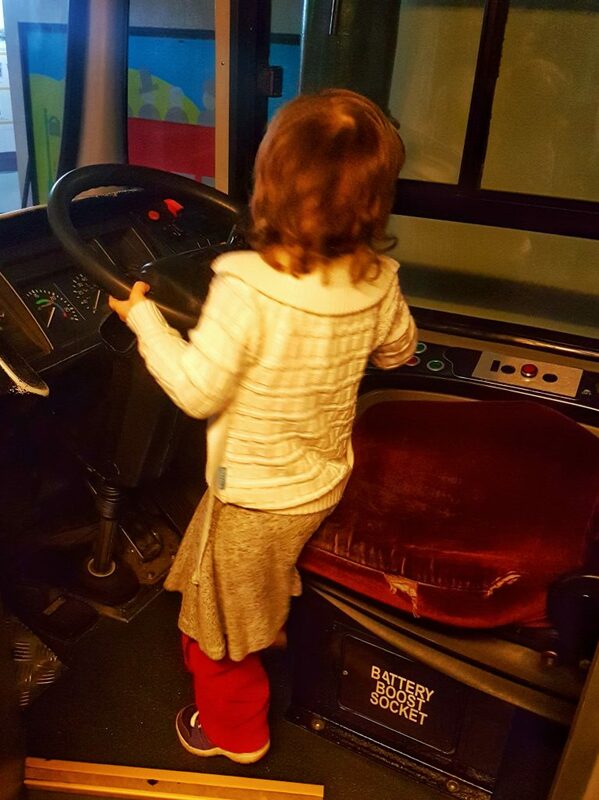 This is the area where kids can drive a read bus, steering the wheel, turning on the light and being careful to stop when the real traffic light in front of the bus turns red. They can also drive the underground train and fix the issues that appear in the meantime. 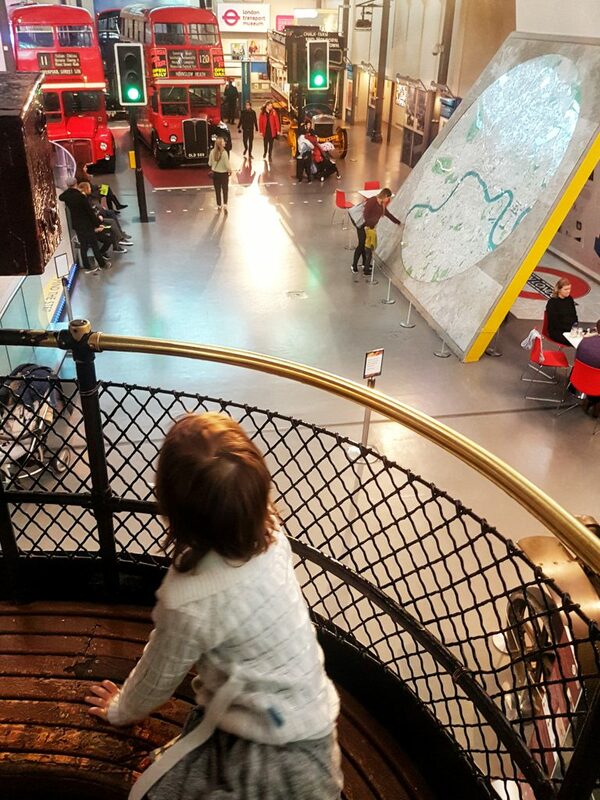 When the kids finally accept to leave this area (trust me, it takes a while) and go to explore the rest of the museum, you will reach the ground floor via lift or stairs. Quick tip: if you want to follow the Stamp Trail, you have to go back to stamp 4 and go down from there (you can easily check the map on the paper). On the ground floor, following the trail, you will reach the “Digging deeper” area. 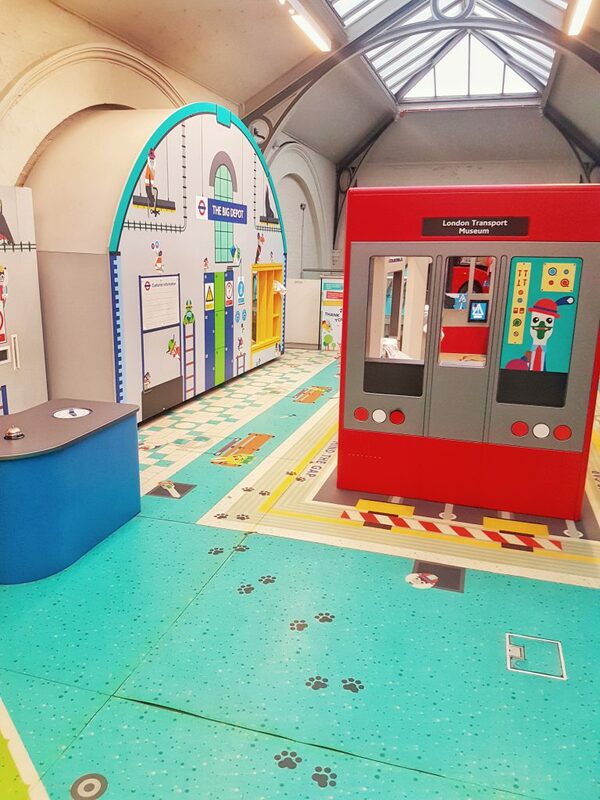 Here you will find more details about the story of tunnelling and kids can learn the world’s first tunnel under a river was built under Thames – the project started in 1825 and it took 20 years to complete. 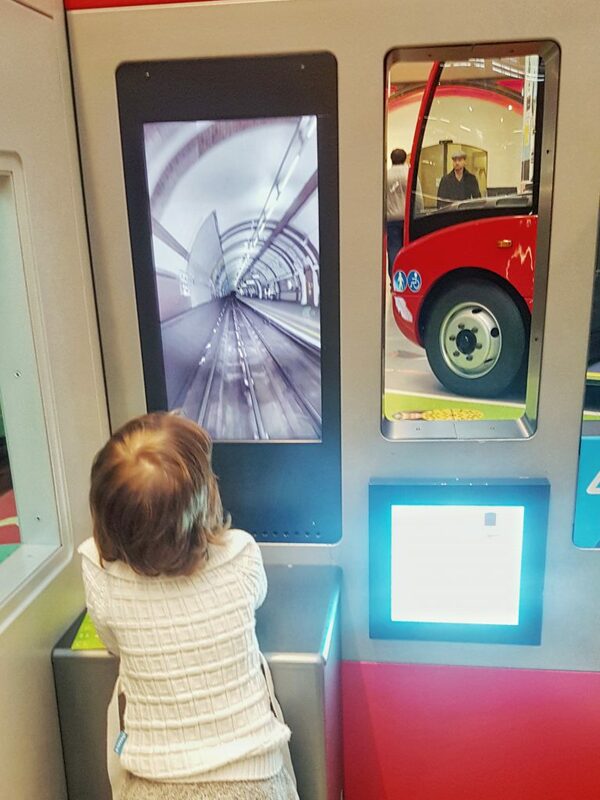 In this area, older kids will be fascinated to see how steam can generate electricity for the underground trains, while younger kids will love to build a set of foam tunnel rings. 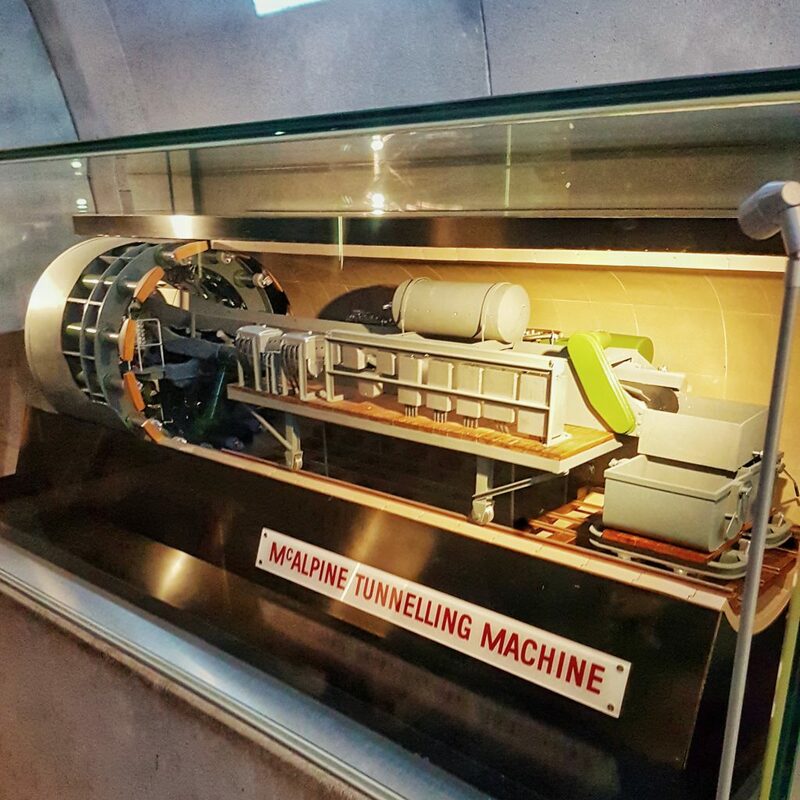 Capable of excavating 600 feet per week and used for Victoria line 1964 – 1966. 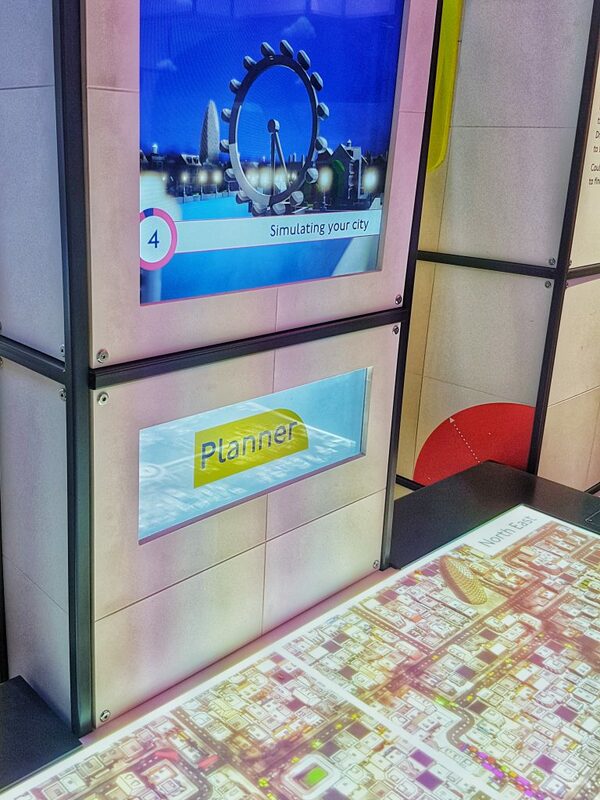 The next section, called “London by design“, is another interesting area. 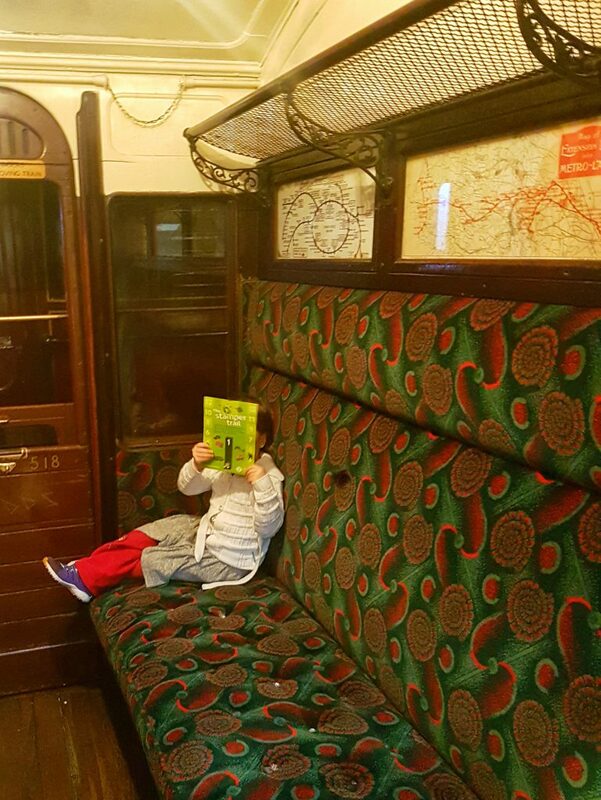 This is the place to take your time while the younger kids chase the moving pictures on the floor to read about London Transport, which was created in 1933. 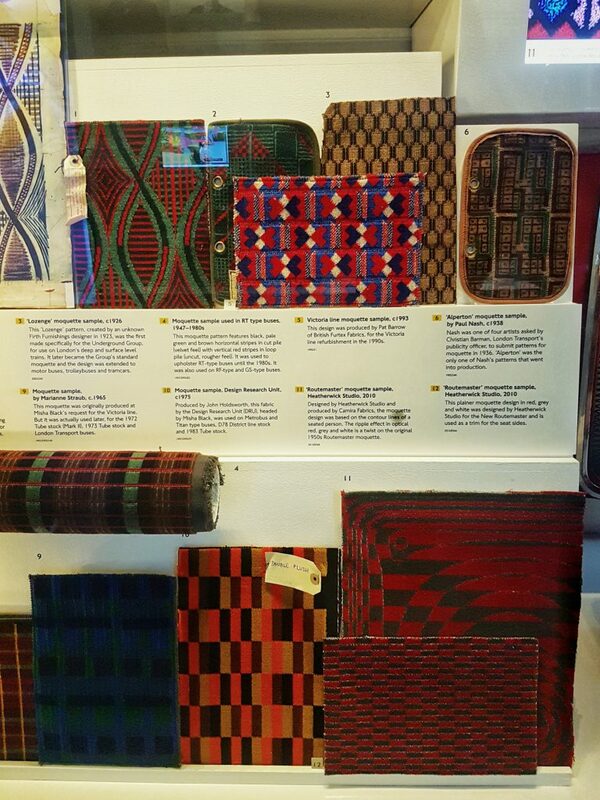 You will find information about the design of all the signs, read about the Bullseye and find out how the moquette that is used in all the buses and trains is made and why it’s so special. 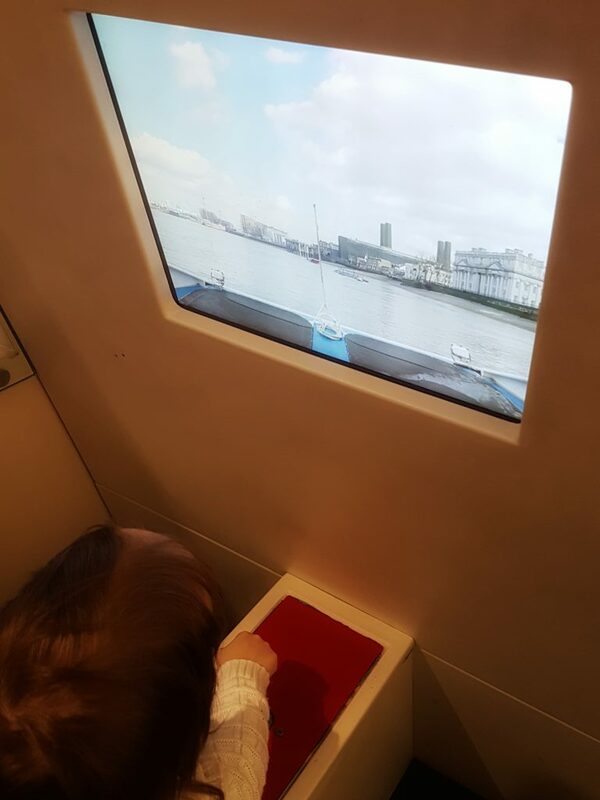 And yes, kids also love this area as the train is completely different from what they travel in the present and they do like to push the buttons that make the toy trains go. 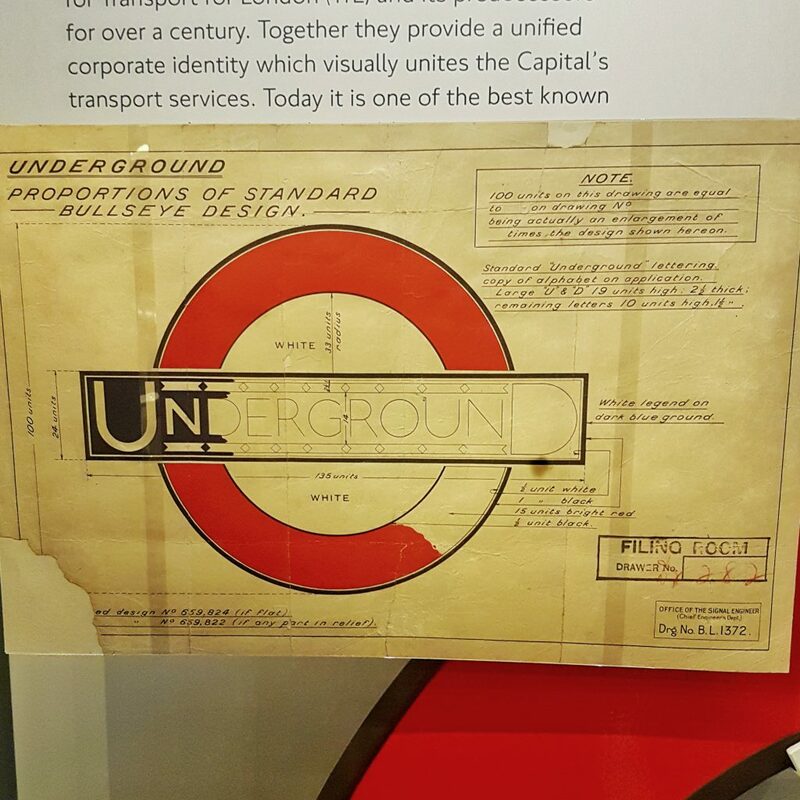 The next area is ‘London at war’, a great exhibition dedicated to the staff of London Transport that managed to keep the tube running throughout the world wars, despite providing an underground home every night for thousands of Londoners during the Blitz. 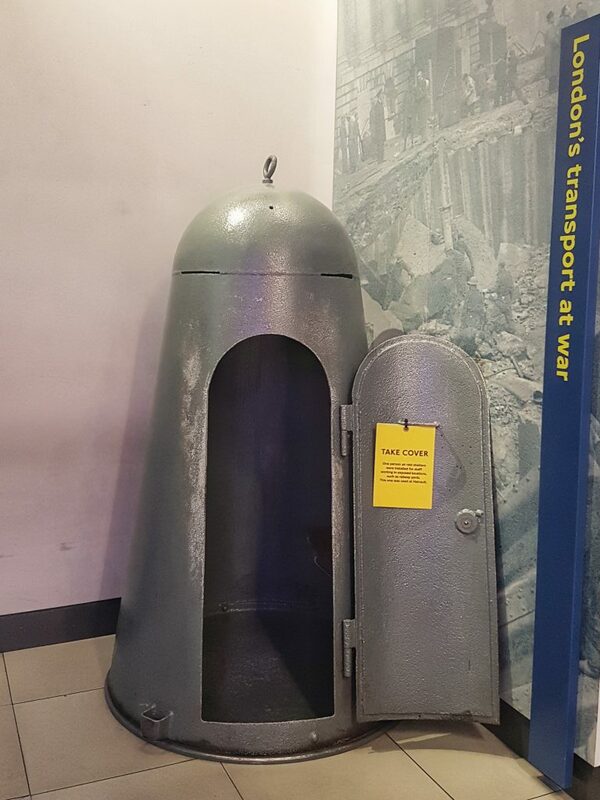 The exhibition also includes a one person air raid shelter which was actually used at Hainault, East London. How exciting is this? 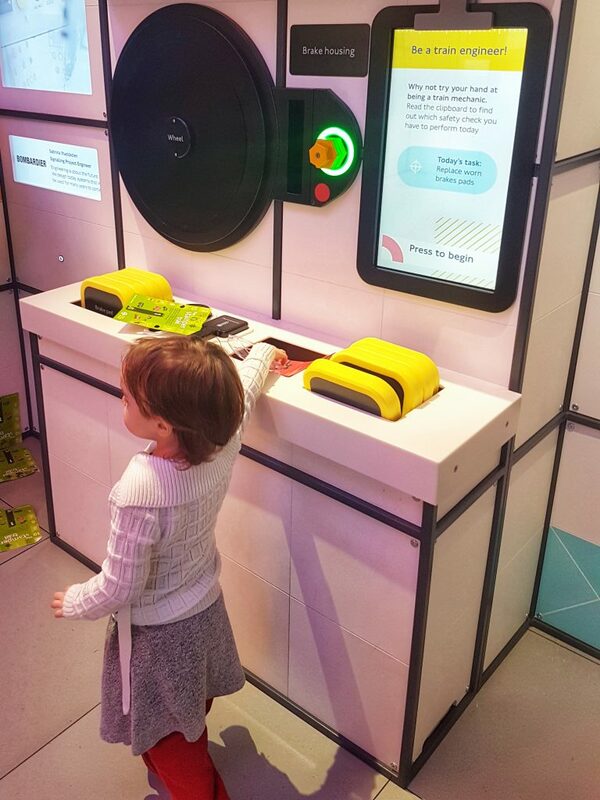 And next to the area is the “Future Engineers” zone, opened in October 2018. 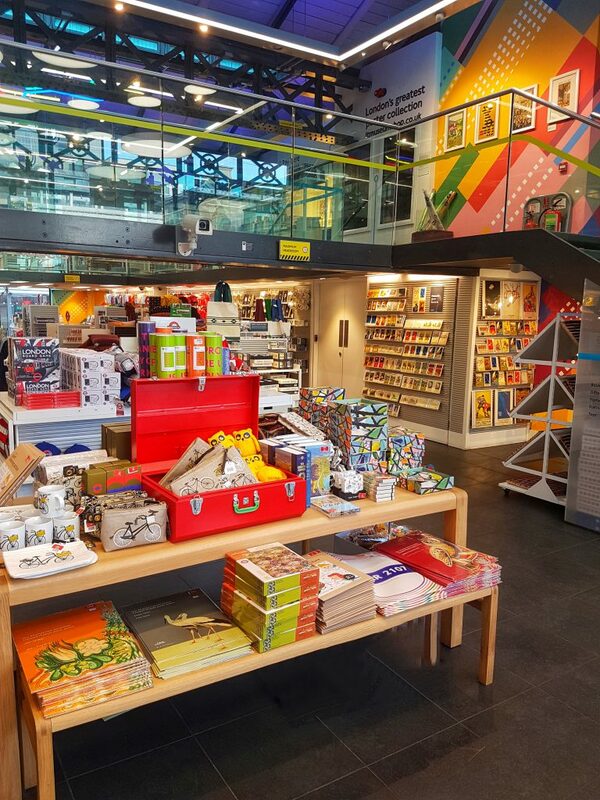 You will spend a lot of time here, so I could just as well tell you what to expect and why you and your kids will love this gallery. 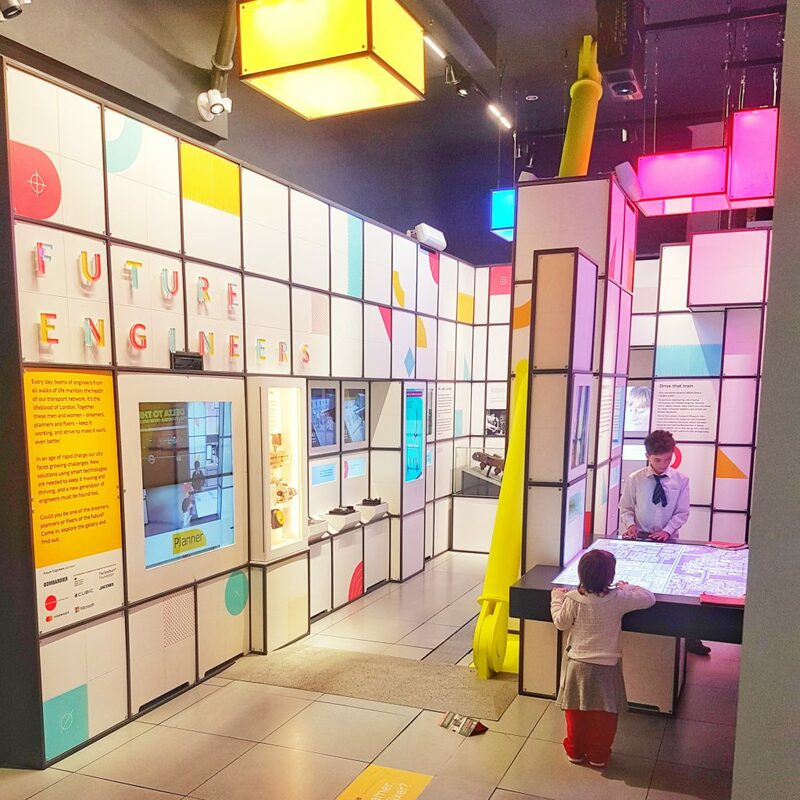 This gallery is meant to inspire an interest in STEM subjects (Science, Technology, Engineering and Mathematics) and highlights the range of jobs available in engineering. 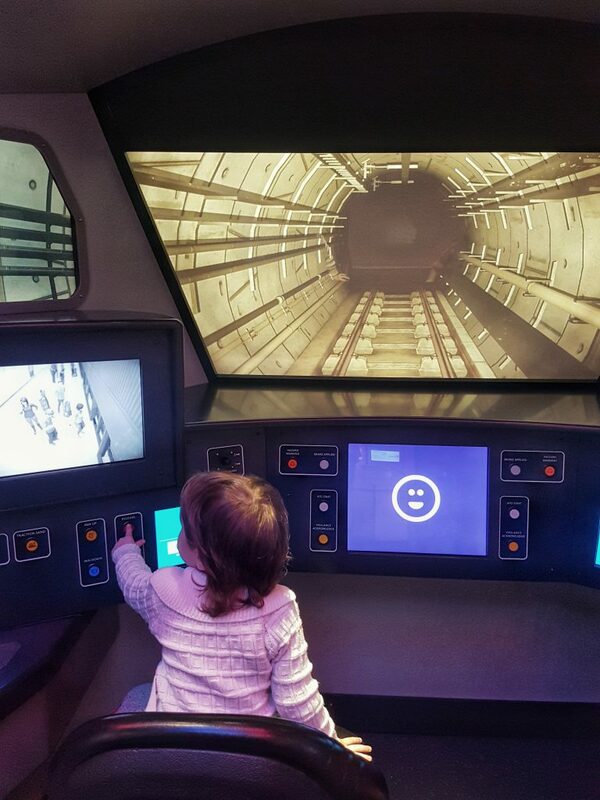 ‘Drive’ a modern Elizabeth line train – this is quite impressive as it feels so real! You even have to solve technical issues and take care of passengers when the doors don’t close properly for example. Be famous for the day by starring on the cover of The Engineer magazine – we had a lot of fun here too, taking photos and sometimes pulling funny faces. 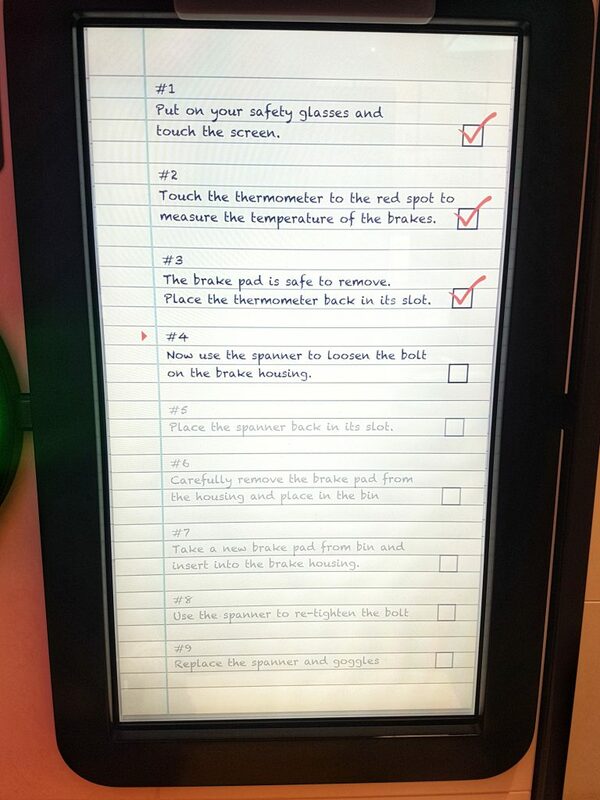 ‘Fix’ a train as part of the hands on ‘fixer’ challenge – and you even have a checklist of jobs that need to be done in order to fix the problem. And the problem changes, because in real life is the same, right? 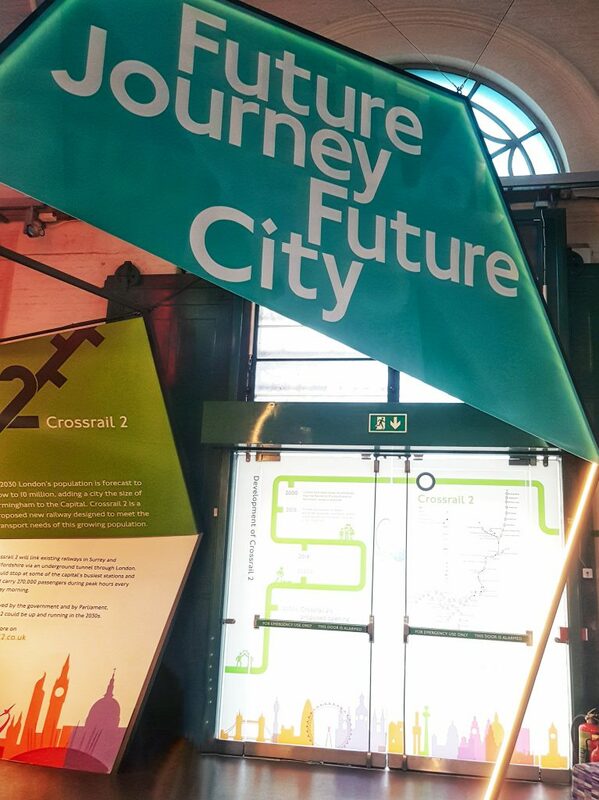 Plan a greener and happier city – and trust me, it’s not easy! You have a specific budget and you need to spend it on green spaces, transport and facilities in order to have happy inhabitant and a healthy environment. (At least) One hour later (no, I’m not kidding, nor exaggerating) you will reach the “On the surface” area, which is divided into two zones: 1900 to 1945 and after 1945. 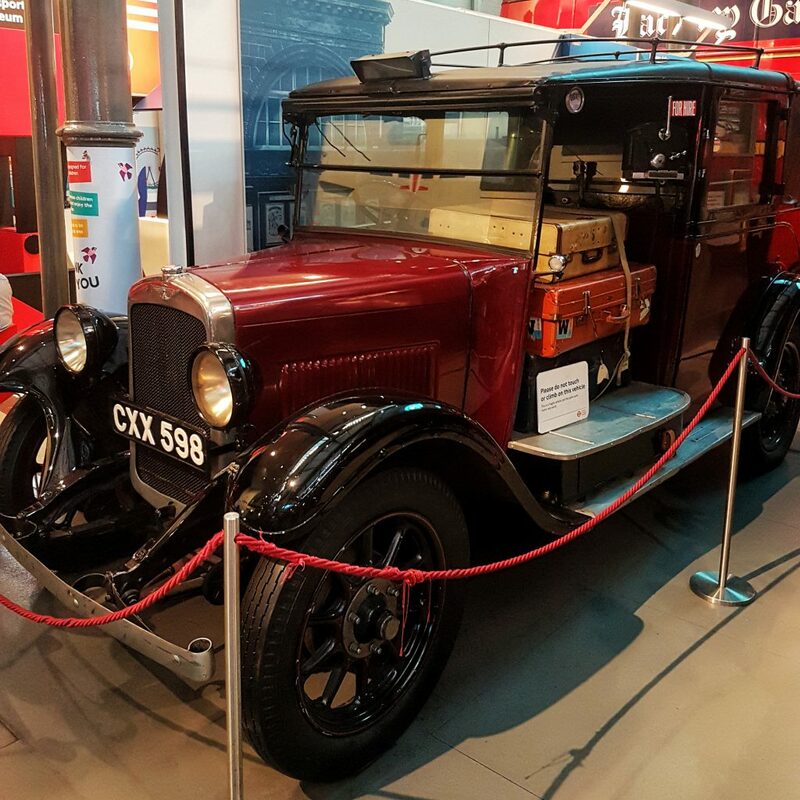 Here you will find old vehicles and it’s really interesting to see them this close. I find this area really interesting for kids as it’s difficult for them to grasp that the world hasn’t always been as it is now. 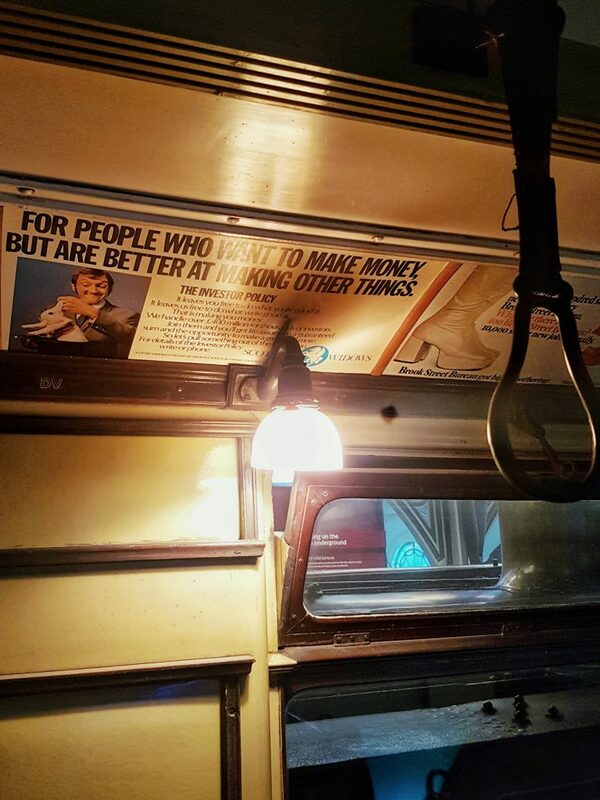 History books and movies do help, but actually seeing real buses and trams? That’s amazing! You can even climb on board old vehicles if you fancy. 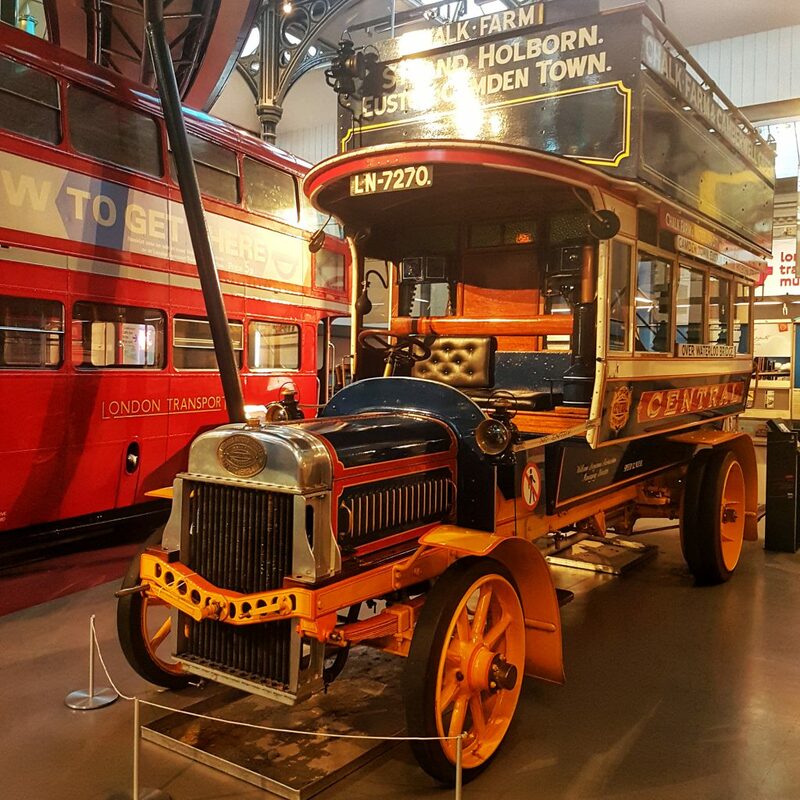 One is a Double Decker and one is a double deck electric tram from 1910. 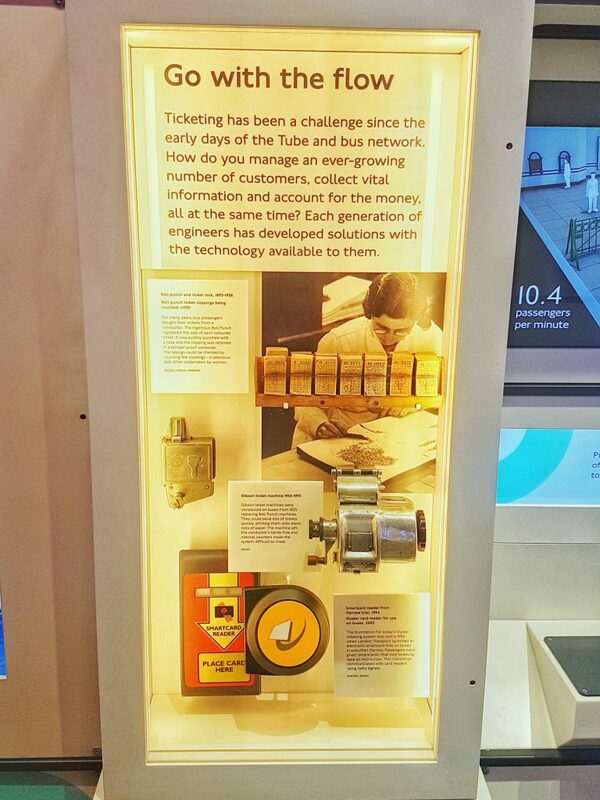 They really take you back in history, with the wooden benches and the lack of doors, the latticed protective fence and the “Used tickets” box. 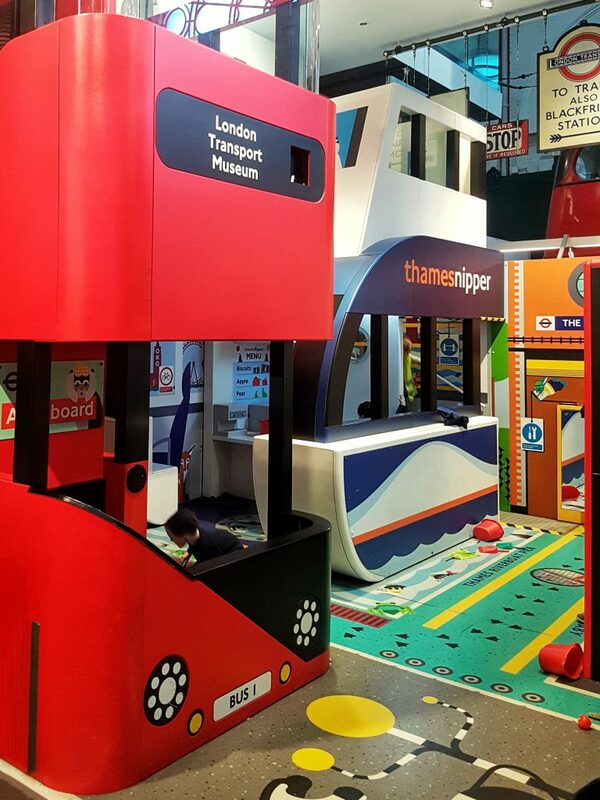 After such a wonderful journey, we usually go to the play zone, called “All aboard” which is next to the picnic area – here is where usually parents can sit down for a bit and catch their breath while the kids have fun with pretend play in a safe and creative environment. 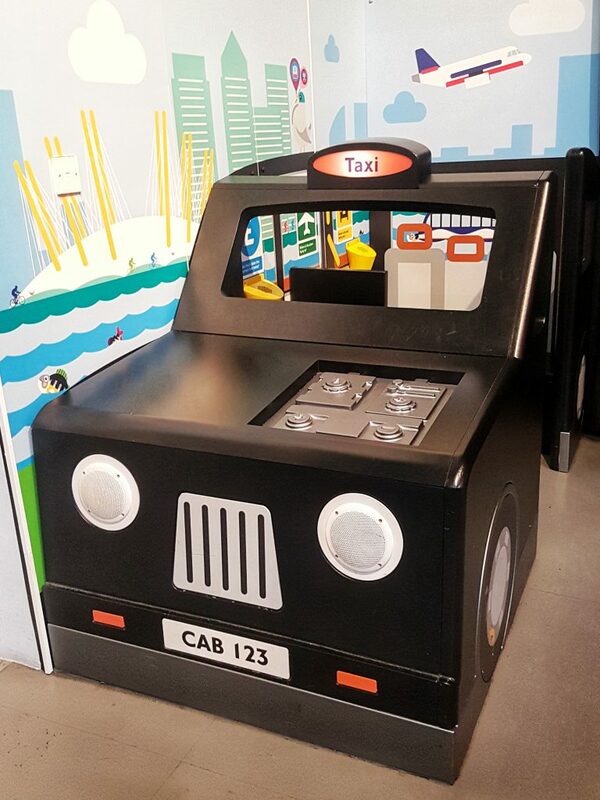 In this hands-on zone, kids can drive a taxi which also counts the miles it ‘goes’. Or they can drive a Double Decker to any place they dream of. Or maybe they would like to be with their head in the clouds? Cable car is the place to go, and they can even ‘take’ photos from up there. And if they dream of a life on the sea or river, they can sail a boat or cook with ingredients and foods and clean with a mop and a bucket on a ThamesNipper. 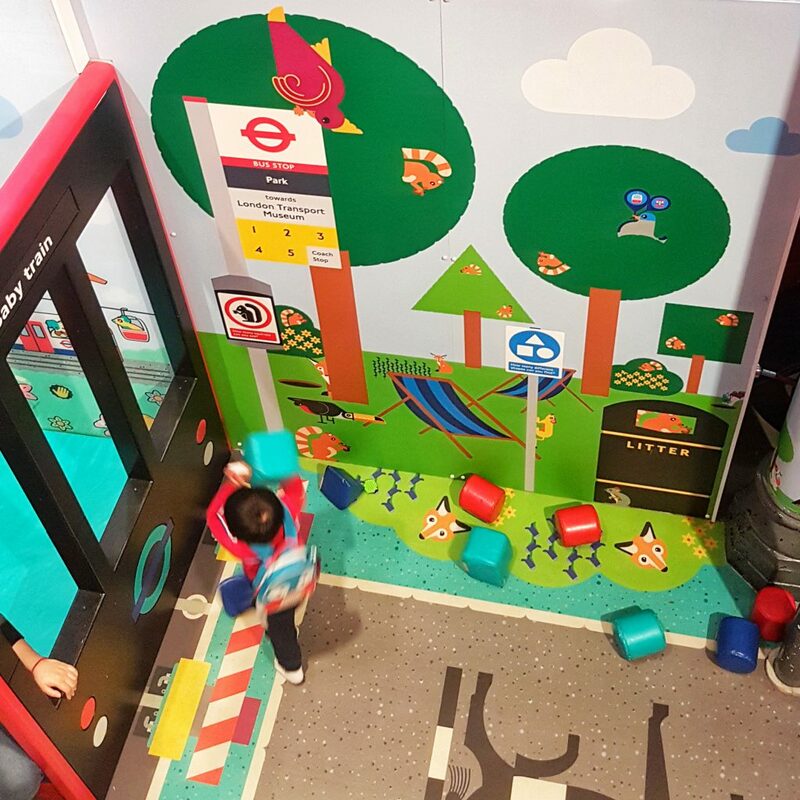 The entire area is designed for kids under 6 years of age, and it also includes a baby area called “Baby Train”, with soft colourful toys. 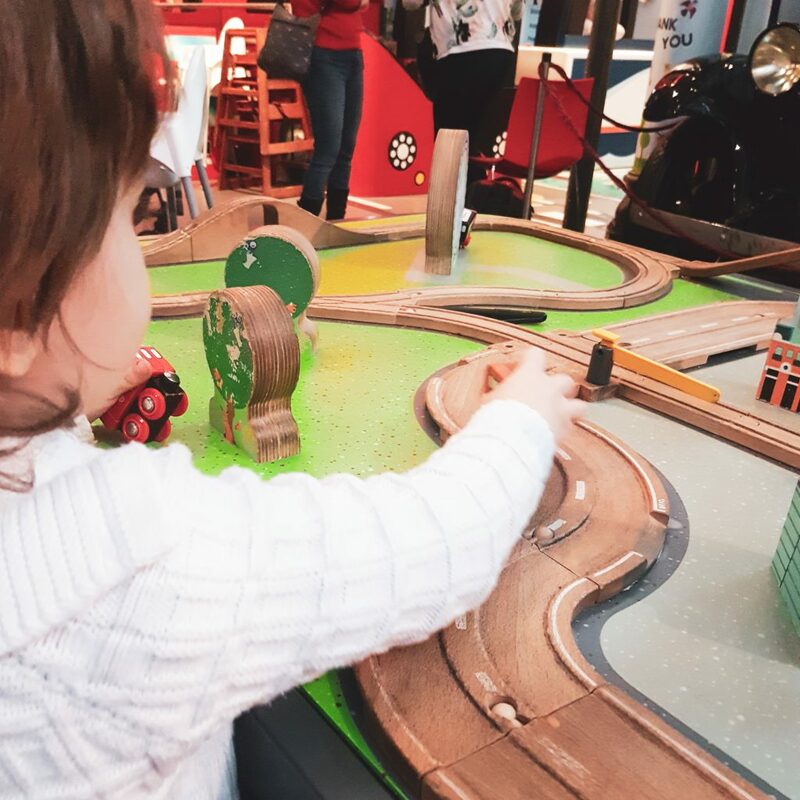 And for all the wooden train lovers, there is also a big train table with bridges and rivers and London city marks and trains that are waiting for the kids to come and play with them. 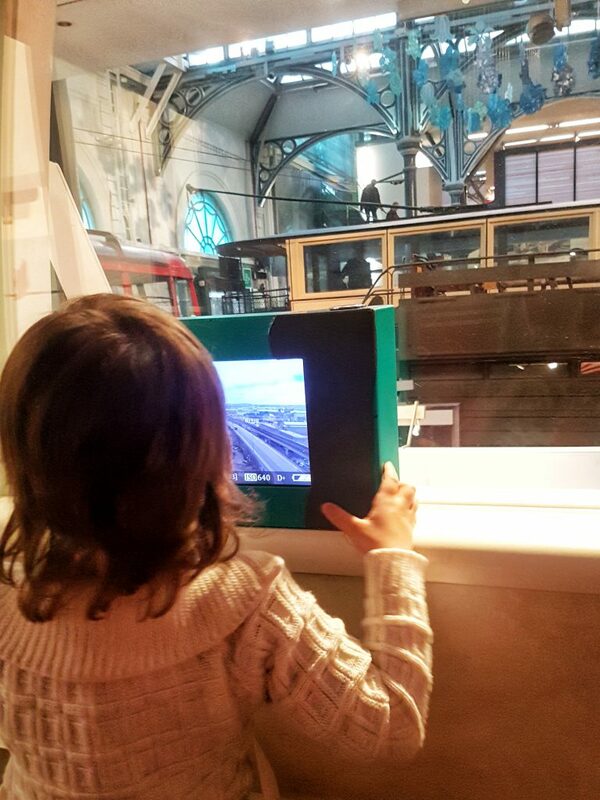 And to my surprise, it doesn’t matter how many tracks and trains kids have at home, this table in the museum is just like a magnet for them! 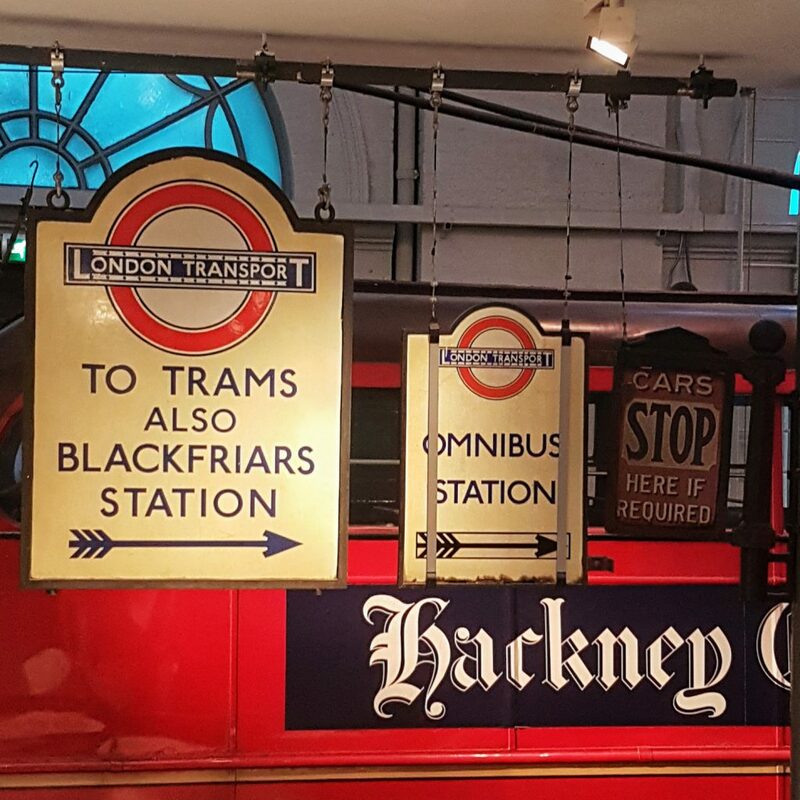 Before heading to the final gallery of the museum, we always stop by the Double Decker (which is next to a real black cab and stamp no 12) and drive, this time even selecting the destination and the voice messages for the passengers. 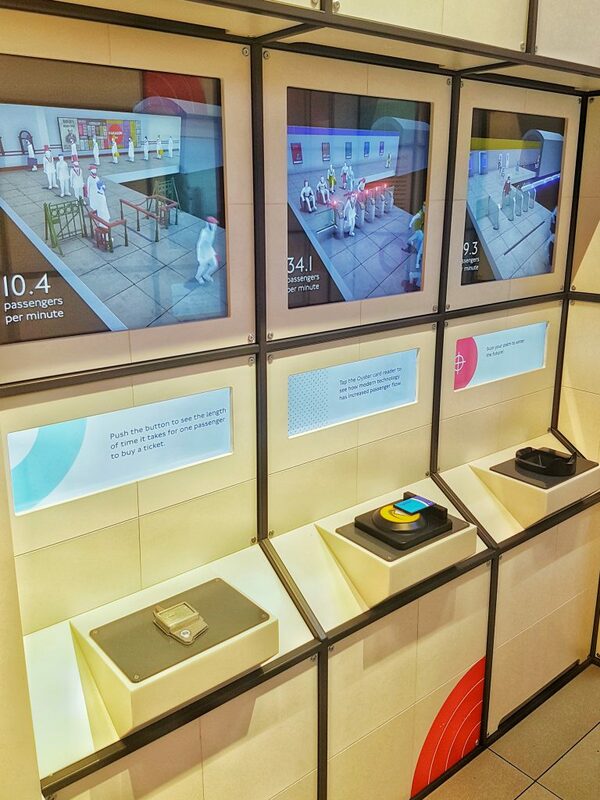 Before leaving the museum, you are invited to step into the future, to try and imagine it. And this is where the fun and interesting journey ends. You and the kids might be sad to leave, but the good news is that the ticket is available for the whole year, so you can return as often as you like and can! 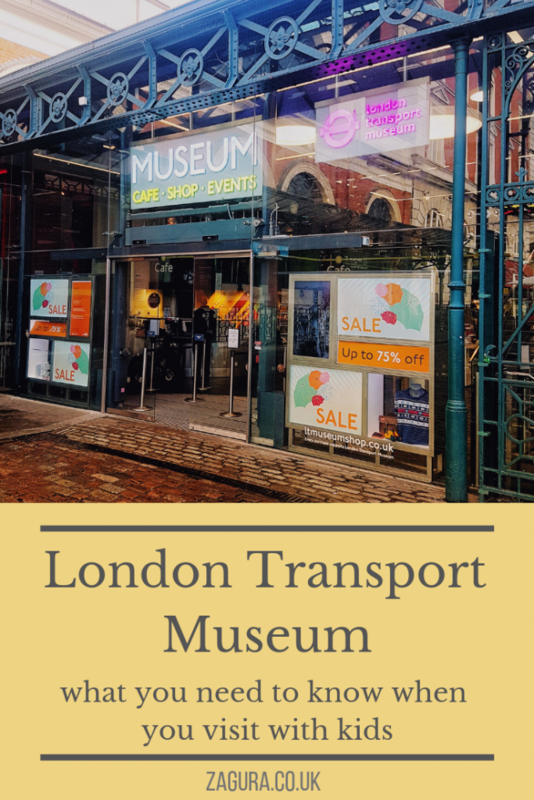 Also, you can buy a souvenir from the lovely shop through which you pass on your way out, to remind you of the amazing experience you had at London Transport Museum. Photos taken by me on a usual visit to the museum. 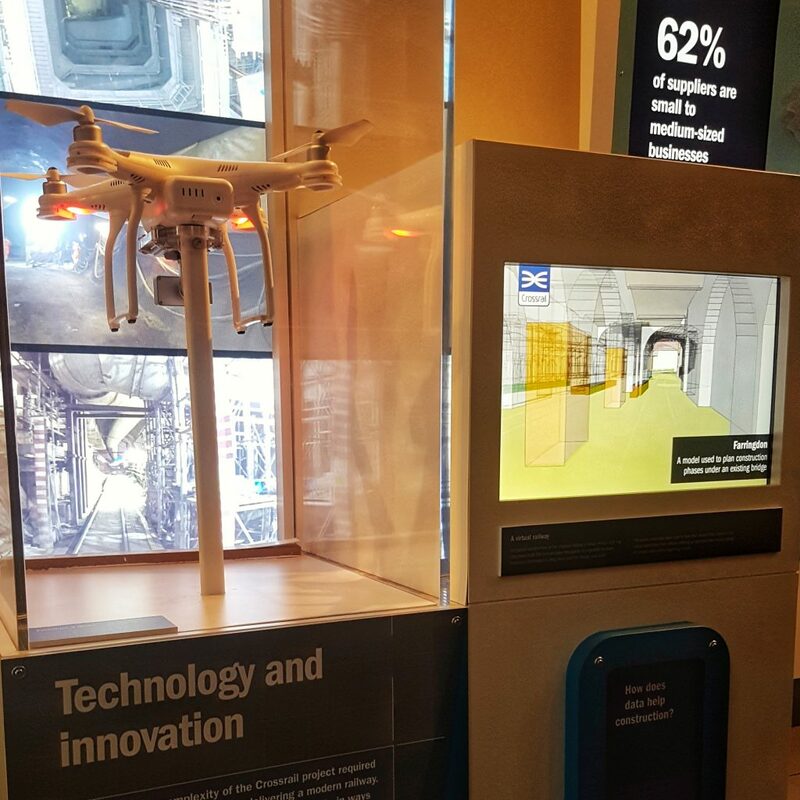 Another informative entry in the series of Museums! 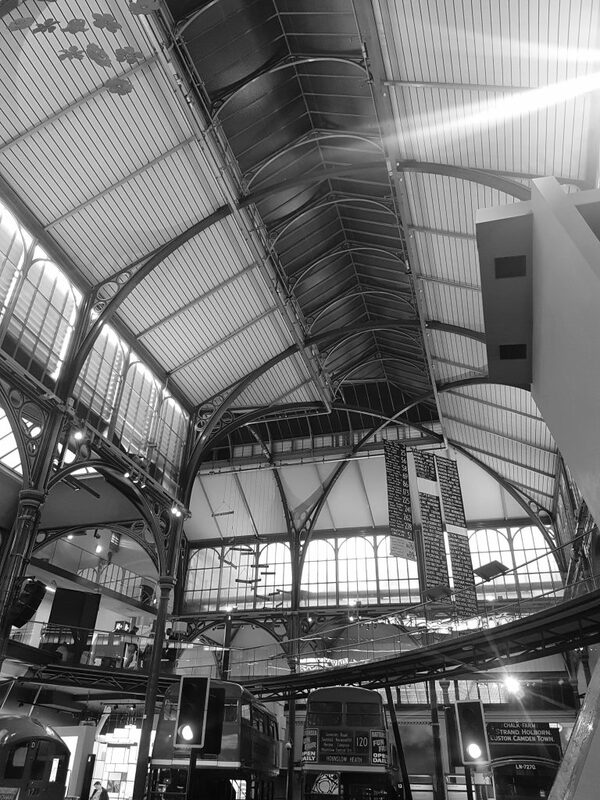 Big City Life comes with the necessity of subways and trains…. 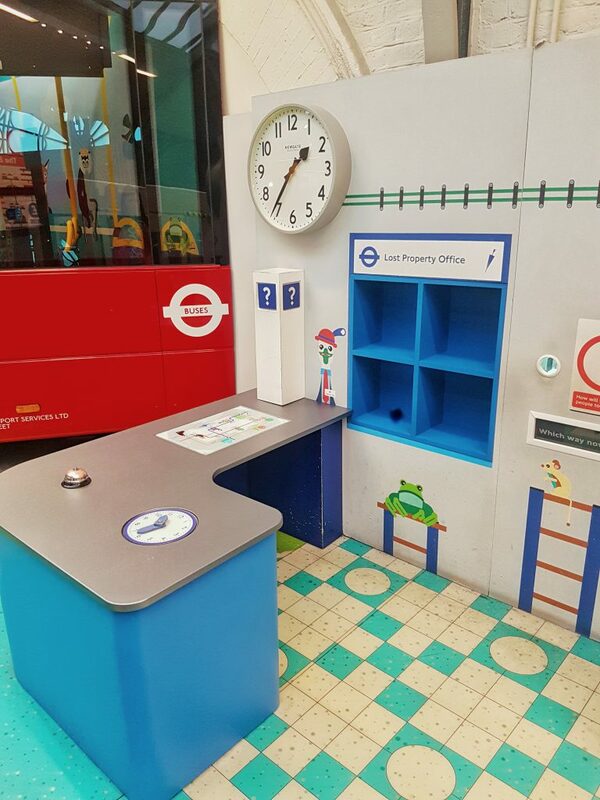 Fun for kids but not so much fun for actual commuters who must move through the system every day to get to work. Much more fun to stay at home and review the wines in the cellar with the wine chef and assorted fun stuff…huh? What am I talking about!? Ooops just making up some filler material 😉 Well, I must confess, I like the selection of graphics you create at the end of articles now. I find the last two more appealing. Anyway, looking forward to further entries on Museums. 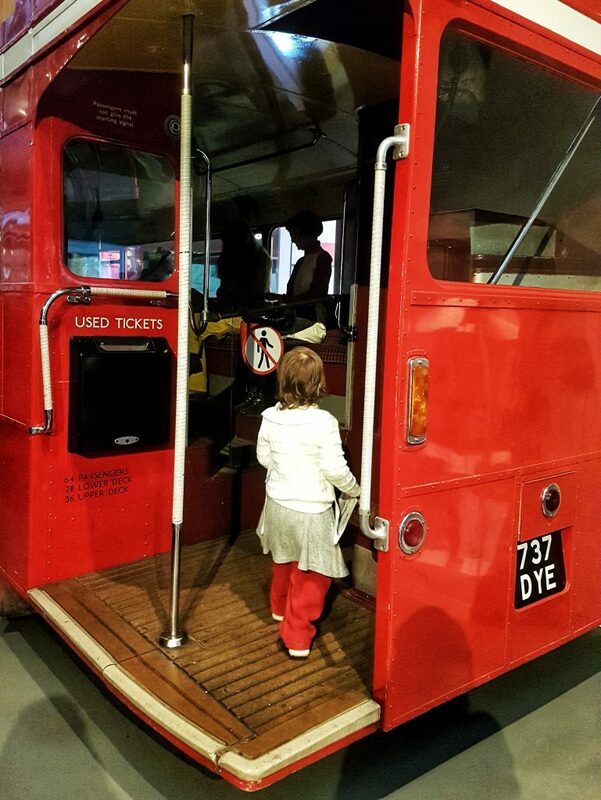 I hear London has some quote famous ones… but are they suitable for children in any way? I’m thinking along the lines of archaeological themed history museums 😉 (You know the one!) Bye for now! I’ll just be here, drooling and dreaming about London, and living vicariously through these pictures! This looks like so much fun! 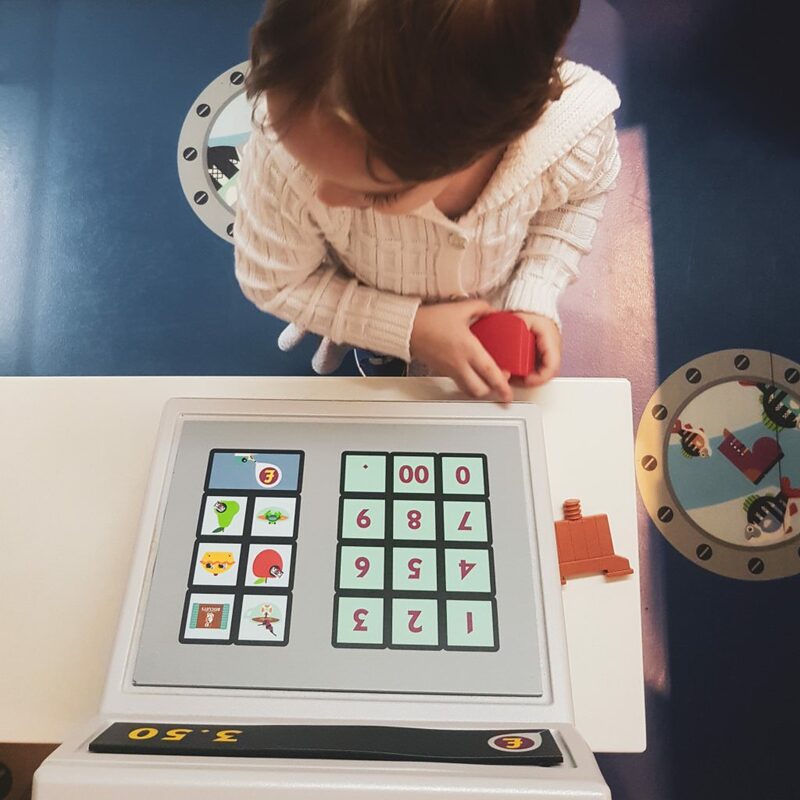 What a great museum for the littles. So interactive! What a awesome day of learning and the photos are amazing. Looking through the photos made me excited since I will be visiting summer time. 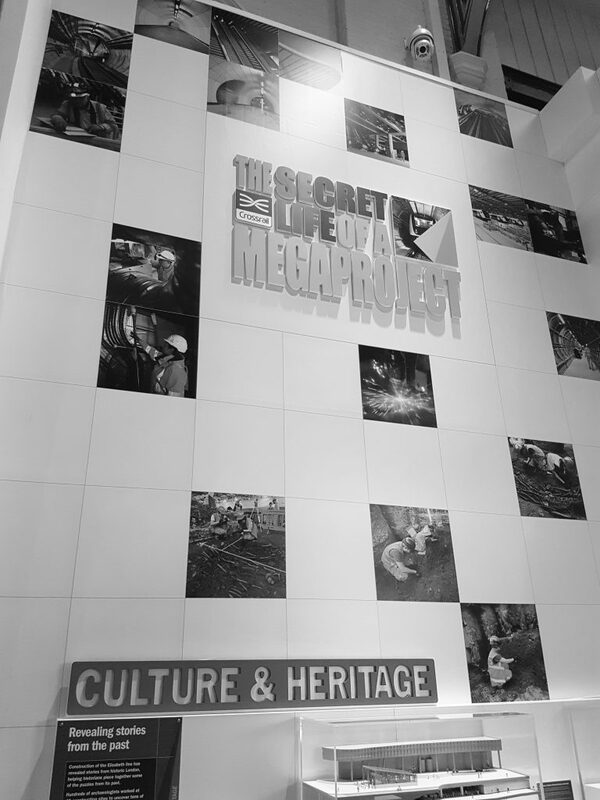 This looks like an awesome museum! 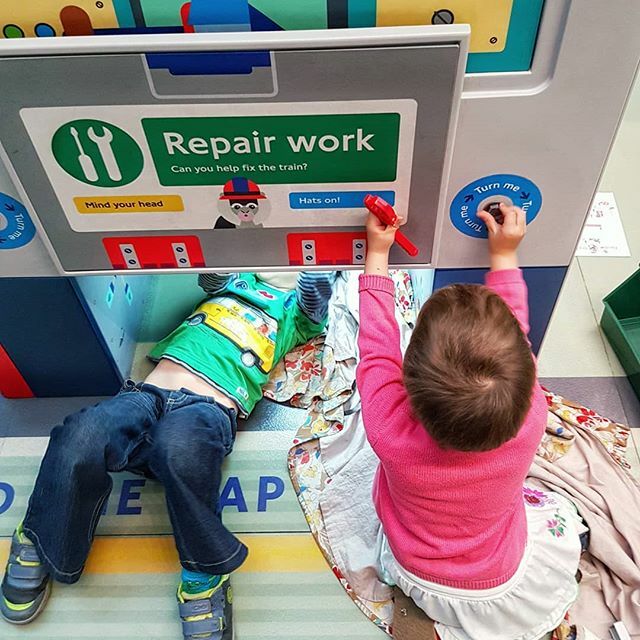 I love all the interactive play areas they have for children. So cool! I love London and my husband and I can’t wait to take our kids. 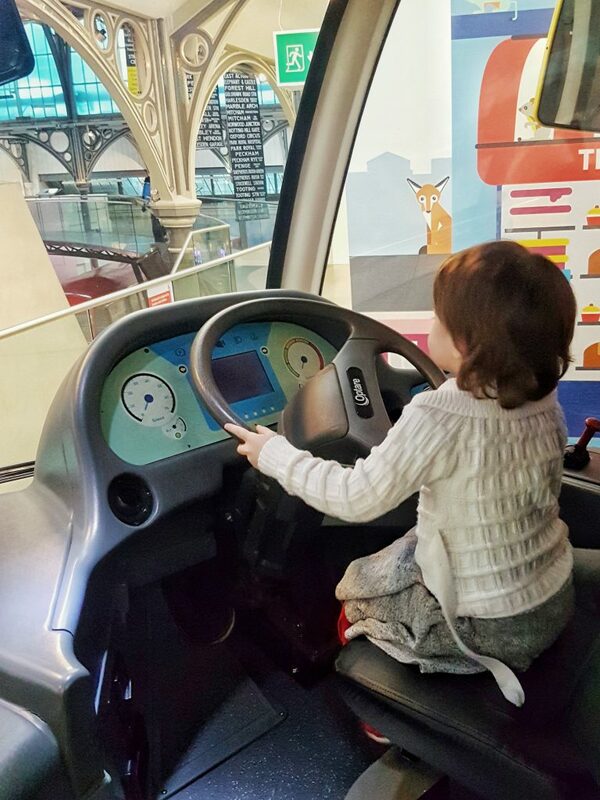 My toddler son would LOVE the transport museum! This looks so amazing! I wish we lived closer so we could go visit because I think we’d love it! Oh, how I wish I could live in London. Wait, first I just want to visit London! 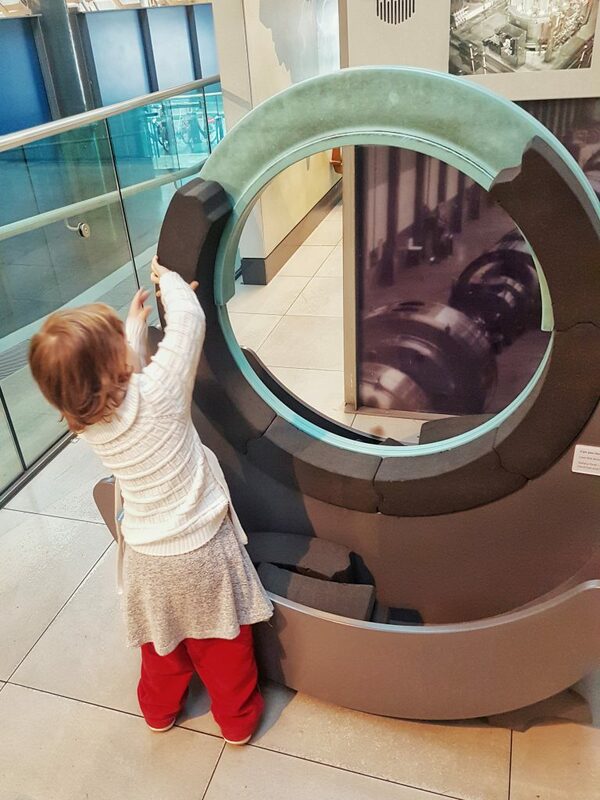 This museum looks like so much fun, I would love to take my little boy there one day! I wish I would have known about this trip when we were in London this past November. My daughter would have loved it. I guess we will have to make a trip back soon! This places looks amazing! 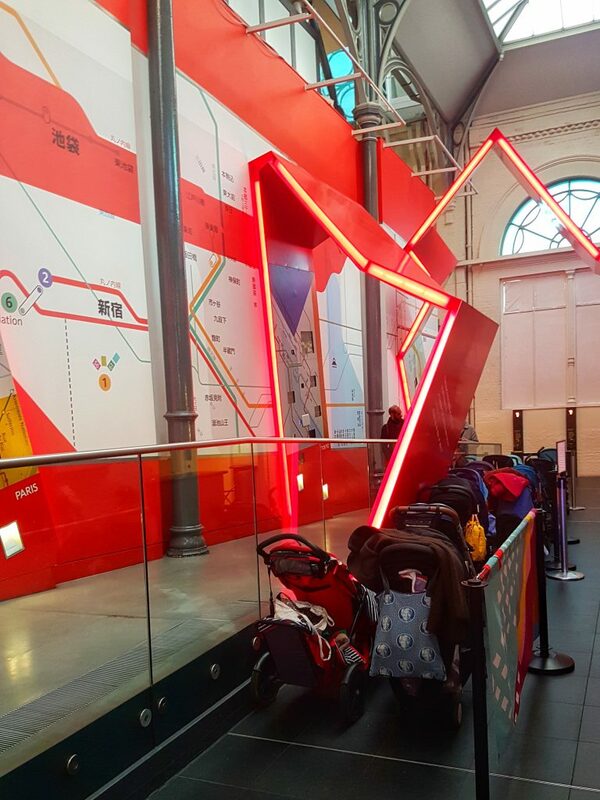 I would absolutely love to take my kids here—they’d die for the stairs on the trains. I’ve walked past the entrance to this museum so many times and always tell myself I’ll pop in, one day. This has definitely confirmed that. Next time in London I’ll stop making excuses and pay it a visit.